The best outcome of gender studies has been the uncovering of neglected woman pioneers of the past — women who left their mark on society in numerous different ways, not only in literature, the fine arts and philanthropy, but also in education, medicine, travel and many other fields. Their work was easily overlooked, especially if they were married to prominent public figures (think of Harriet Taylor, who published "The Enfranchisement of Women" under the name of her husband, John Stuart Mill); those who did draw attention to themselves (like Caroline Norton, with her successful agitation for women's divorce rights) courted censure for impropriety. Jeanie Senior, the subject of Sybil Oldfield's book, was not overshadowed by her husband and was almost universally loved for her refined sensibility, her sensitivity to others' needs and her selflessness in their service. Yet she too came under fire at one point, and has largely been forgotten now. When a big cache of her correspondence came to light in 2000 — Jeanie's letters to her only and much-loved son Walter, and replies sent to her by friends like the artist G. F. Watts — her struggles were at last fully revealed, and it was time for a re-assessment. Jeanie was born Jane Elizabeth Hughes in 1828, the only sister of the author Thomas Hughes and his six brothers. The first chapter deals with her happy childhood in this large, vibrant family, and the next with her subsequent marriage into a very different one. A winsome and vivacious young woman with a golden halo of hair and a magical singing voice, she could surely have had her pick of men; but, devastated with grief after the death of her next oldest brother Walter (the first of many bereavements), she fell into the arms of Nassau John Senior. She could hardly have made a worse match. For reasons of economy, the young couple started off their married life with her in-laws. The problems started almost at once. Despite being an old friend of her father's, her father-in-law was a "cast-iron man of facts": he had drafted the harsh New Poor Law of 1834, and believed, for example, that "a well-regulated workhouse" was the best way to prevent pauperism because the "dissolute poor hate its cleanliness" (qtd. in Levy 7, 251); he had gone on to fight against the reform of factory hours. Jeanie would sneak away from the house to listen instead to Frederick Maurice's sermons. Her only regret, later, was that she had lacked the strength to espouse the Christian Socialist cause openly. Her husband himself turned out to be simply useless, an "old boy" of King's College School, London, of whom the school has no cause to be proud. He could never hold on to the opportunities his wife gamely secured for him, and condemned her by his indolence to a lifetime of financial worries. No wonder Watts and the French short-story writer, Prosper Mérimée, both sympathised with Jeanie. Her relationships (not liaisons) with these two very different personalities are the subject of Oldfield's third chapter, and thanks to the newly-discovered Watts letters the analysis of his feelings for Jeanie is fresh and persuasive. The artist, who painted her portrait in 1857, obviously adored her, but he was much too emotionally confused and overwrought himself to come to her rescue. In Chapters 4 through 6, Oldfield returns to Jeanie's painfully fraught family life, with all the demands that it made on her. A mother herself now, she threw open the new family home, Elm House in Wandsworth, to her brother Hastings and his four little motherless children, as well as to an unrelated motherless girl and her own and her husband's widowed mothers. Yet she still had energy and emotion to spare for the larger world, and especially the dregs of society whom her father-in-law had scorned. She visited workhouse inmates, supported a local industrial school for girls, and became the active helpmate of the social reformer Octavia Hill in her housing projects for the poorest of the poor (Chapter 7). A welcome interlude on Jeanie's musical development and friendships follows in Chapter 8. Amongst many others, she was a close friend of the singer Jenny Lind, the pioneer photographer Julia Margaret Cameron, Dickens's daughter Kate and Thackeray's daughter Anny. Oldfield goes on in Chapter 9 to argue convincingly for Jeanie as the inspiration for George Eliot's most famous heroine, Dorothea in Middlemarch, clinching her argument by quoting Eliot's letter to her "Dear Friend" about the diffusive effects of her goodness (136). Oldfield is not the first to suggest this: "Dorothea is you," a friend wrote to Jeanie in 1873, "in her great loving heart, in her desire to benefit all the world, and in her perfect self-forgetfulness she is just you" (qtd. in Oldfield 142). Jeanie's letters to Walter continued right from the boy's prep-school days in Brighton through his Rugby and Oxford years and beyond, and she poured out her heart to him unreservedly. It is clear that this beleaguered but ever-generous soul gave more and more to her family and to the outside world. On the one hand there were her intensifying domestic battles, with an impossible mother-in-law, her own mother, her often ailing foster-children and her hopeless husband all depending heavily on her. On the other hand there was her escape, her own form of therapy: hours spent working tirelessly for the relief of the wounded in the Franco-Prussian War — efforts which led to the establishment of the Red Cross (Chapter 10); and her work on behalf of pauper children in the North Surrey Workhouse School District. The latter led in turn to her appointment as a Poor Law Inspector, making her (to the delight of such notables as Josephine Butler, Mary Carpenter and Florence Nightingale) the first woman civil servant. It was this, of course, that finally put her in the public eye, and exposed her to censure. Her resultant report on the education of pauper girls was more than simply competent. It was "outspoken, critical, humane" (Oldfield 218), full of damning findings and practical recommendations, advocating in particular the "boarding out" of the pauper orphans currently housed en masse in almost prison-like conditions; but it did not please the establishment. In fact the former Chief Inspector slated it utterly, in the most sexist terms, saying that anyone could see "that no fair conclusion could be arrived at by a party of ladies trying to master so complicated a question in a few months." He went on disdainfully, "I cannot express to you the anger your statements have excited, among the experts on this subject" (qtd. in Oldfield 223), concluding that the report would simply have to be suppressed. Jeanie won the battle that ensued, but at great personal cost: the report was published to initial approval, but she suffered a dreadful bout of bleeding from her cancer, which left her no option but to resign from her post. Subsequently her support in the press faded, and instead of opening up new opportunities for women in the civil service, her outspokenness effectively closed the door on their appointment for years to come. The Whitehall debacle and its bitter consequences, described by Oldfield in Chapters 11 to 14, led to her final emergence as a "lady belligerent" (quoted from a Times leader 239). Writing in great pain from her sickbed, she vigorously defended herself against the former Chief Inspector's attacks, and at last espoused the Suffragist cause (Chapters 15 and 16). Jeanie battled on unremittingly right to the end, despite the devastation of her illness and a financial crisis that eventually entailed a move from her beloved Elm House. By this stage she was embroiled in the conflict between her new pet project, the MABYS (the Metropolitan Association for Befriending Young Servants) and another similar but more judgemental Anglican project, the GFS (the Girls' Friendly Society). With the support of Octavia Hill and Lord Shaftesbury, the MABYS were kept afloat, and continued to help the very poor and not necessarily "respectable" girls whom the GFS spurned (Chapter 16). While the MABYS survived, however, Jeanie herself did not, dying of "Cancer of the womb and exhaustion" in 1877 at the age of 48 (quoted from her death certificate, Oldfield 285). She was buried in Brookwood Cemetery in Surrey. 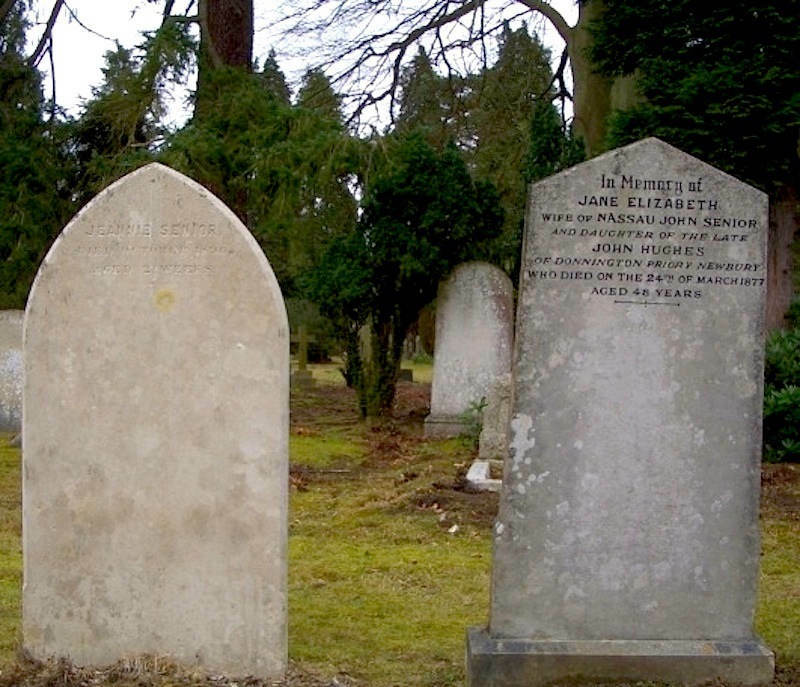 Next to her grave and with a similarly sized and similarly plain headstone is that of her infant granddaughter Jeannie Senior, the first of her Walter's two children, who was born and died long after her in 1896. Both headstones have been recently restored. Anxious not to write a hagiography, Oldfield carefully considers some criticisms of Jeanie in her "Afterwards" (Chapter 17). But it is hard to blame this plucky and open-hearted woman for not having managed to blaze a trail for other women in Whitehall, or even for accepting her civil service appointment when her health was compromised. Hers was a life well lived, and unlike Dorothea, she did have her effects, calculable as well as incalculable. The voluntary organisations which she founded or helped to found had an enormous impact, both here and abroad, and her staunch promotion of foster-care and adoption was a valuable first step towards the release of destitute children from impersonal institutions. Less calculable but just as inspirational was her exuberance, shown in some poignant vignettes: Jeanie with her "bright face" going to sing for poor Thornton Lewes, G. H. Lewes's son, on his deathbed (Oldfield 132), for instance; or calming a class of East End children excited by street violence. A fellow social activist, present on the latter occasion, reported that as her voice soared into the dark court where they were gathered, the fighting was forgotten, and the gaslight made her fair hair into a halo, so that "she seemed to some of us to be one of the angels of whom she sang" (qtd. in Oldfield 168). This may not be a big book about a major figure, but it throws new light on several who are major figures, especially G. F. Watts and George Eliot, and covers some largely untrodden territory, not least the British public's response to the Franco-Prussian war. Besides, is it not just the major figures who make history, but the stalwarts pushing against the tide of human apathy and prejudice in their more humdrum lives; and in this meticulously researched and beautifully written book, Oldfield has brought one of these stalwarts back to life. Much loved and admired in her own age, a champion of the sick, needy and downtrodden, a woman who did almost more than humanly possible to overcome hugely unequal odds, Jeanie Senior sings again for us now. Anyone interested in the Victorian period will find this account of her struggles informative, absorbing — and intensely moving. 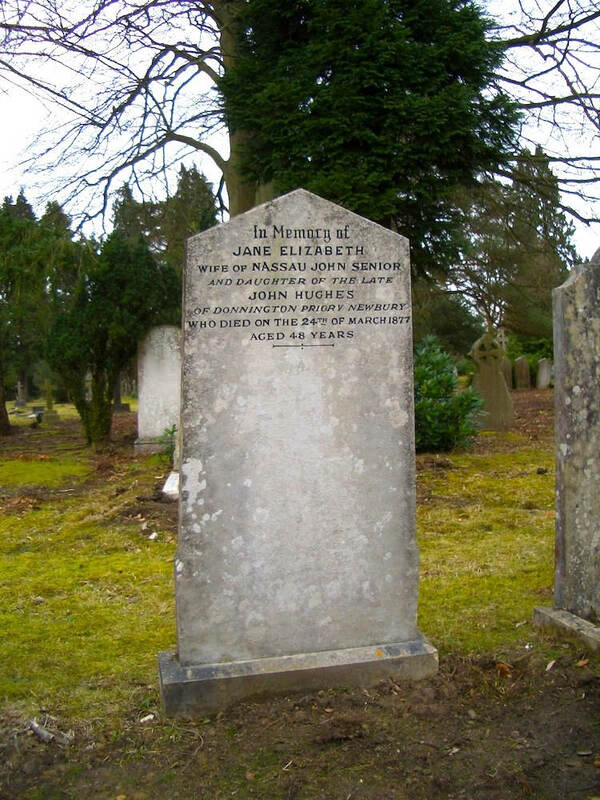 Jeanie's headstone at Brookwood Cemetery also features on the Brookwood Cemetery Society's site. 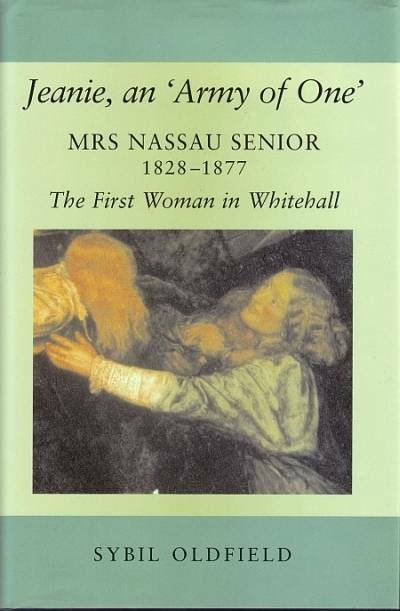 The accompanying information there describes her misleadingly as a founder of the Girls' Friendly Society: attempts had been made to draw her in, but she had felt from the start that the organisation had "too strong an element of Episcopacy and priestdom to suit me completely" (qtd. in Oldfield 227). "The Victorian Poor Law and Life in the Workhouses." "A London Slum: Market Court, Kensington." Levy, S. Leon. Nassau W. Senior, 1790-1864: Critical Essayist, Classical Economist and Adviser of Governments. Newton Abbot: David & Charles, 1970.